BioFix is a module-type wastewater treatment plant which consists of one or several blocks and is intended primarily for treating domestic wastewater and similar industrial wastewater. The capacity of the plant and degree of purification depend upon the size and number of the blocks. The purification process runs usually in three stages: mechanical pre-treatment, biological purification (which is also multistage) and chemical post-treatment. 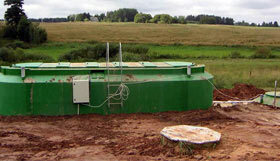 Larger models are equipped with excess sludge tanks. The mechanical treatment takes place in a screen unit and a primary clarifier and the biological purification in a fixed film reactor, whereas phosphorus is chemically removed in the secondary clarification block. In certain cases biological purification is combined with chemical pre-precipitation. RBiological treatment is carried out, using a comparatively new technology of combining extended aeration with a fixed film reactor. The aeration chambers of the reactor are filled with porous plastic support media with a large specific surface that becomes covered with a biological film, the biota (bacteria and protozoa) of which use the waste water organic matter for food. The necessary for aerobic micro-organisms air is supplied by diffusers located at the bottom of the reactor. The fixed film bioreactor is multi-stage, whereas the number of stages depends upon the pollutant load of the treatment plant and the necessary degree of purification. In addition to organic matter nitrogen is removed. Phosphorus compounds may also be removed biologically, but usually this is done by chemical precipitation prior to or after biological purification. The main advantage of biological reactors compared to activated sludge treatment plants is the much (even 50-fold) lesser amount of excess sludge. The amount of biomass in the reactors is regulated by protozoa and the film that sloughs off the support media is nearly totally mineralized. The small amount of sludge cuts running costs. If necessary, the effluent may be disinfected by UV-radiation. BioFix 45 to BioFix 150: plants for small and medium size objects, having a capacity of 50 to 150 m3/d; 300 to 1000 PE. In 2006–2007, the small treatment plant BioFix 1 was tested according to European Union standards at the Finnish international testing centre. The treatment efficiency of the plant proved to be excellent and stabile, and the plant was granted a CE marking. During two separate test series (see the CE testing report) the efficiency of organic matter (BOD7) removal was 95 and 97% (the BOD7 of the effluent being 9.9 and 3.1 mg/l), respectively.